The Samsung Galaxy Note 3 release is rolling out worldwide and the latest Android phablet device is bound to be another big success for the company. Some models are equipped with an Exynos Octa-core processor while others features a Snapdragon quad-core CPU. A new video compares the Galaxy Note 3 Exynos vs. Snapdragon variants. Just like the Samsung Galaxy S4 that came out earlier this year, the type of processor in the Galaxy Note 3 depends on which market you are in. One Note 3 variant (N9000) is powered by a 1.9GHz Exynos Octa-core processor) and the other (N9005) by a 2.3-GHz Qualcomm Snapdragon 800 quad-core processor. 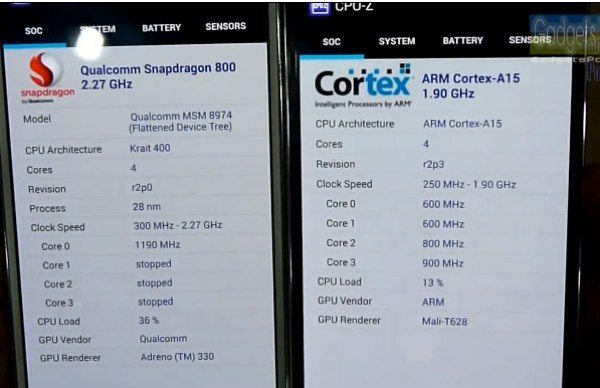 There has been plenty of debate about whether the Exynos or Snapdragon-powered Note 3 would perform best and now some intitial testing has taken place on both, as shown in the YouTube video that you can see below this story. The video begins with some detail about the markets of each variant and then highlights some of the other differences between the two models such as the upload and download speeds and camera capabilities. It then moves on specifically to the CPUs and GPUs for each, showing benchmarks. Benchmarks for the Snapdragon variant are slightly better than for the Exynos variety, but ultimately both models give an excellent performance. There’s plenty of interesting information in the video and you can check it out below. You can see details of which model is available in world regions here. Are you intending on purchasing the Samsung Galaxy Note 3? Let us know with your comments.